Human complexity and differences make absolute equality meaningless. But extreme inequality of wealth, social power, and status concentrate social power and reduce social capital, degrading creative energies and interactions needed for generating wisdom. So nurture basic equity as both a resource for and a feature of a society that works for all. The idea that people are equal seems to make less sense the closer you look at it. Fortunately, the issue of equality is more complex and interesting than many people realize. For example, it is properly argued that people should be treated equally, in the sense that everyone should be considered “equal before the law”. It is further argued that there should be equality of opportunity, in the sense that everybody should be treated equally when it comes to taking advantage of certain opportunities in life, such as getting a job or getting an education. It makes sense to try to equalize treatment and opportunity, and we can make a lot of useful progress on those ideals. But that doesn’t mean people are existentially equal or are being equal in the ways they show up in life. Lots of people do not make these distinctions and it can confuse matters unless we’re clear about this. In order to create the quality of life and wise democracy that we are seeking, we need to regulate certain differences. Because to the extent we let all differences manifest fully in the society – which is what happens when we attempt to maximize freedom – people who have certain capacities will gain more social power, respect, money, and so on than other people – and while that’s ok in one sense, it has a very important dark side. In general, the more freedom there is in a system, the more inequality we find – and the more equality we push for, the more freedom gets limited. This is one of those paradoxes or dilemmas, two things that dance with each other (see the Healthy Polarity Dynamics pattern). Neither one can be maximized totally, but we can help the dance play out in life-serving ways. For this reason I didn’t name this pattern social equity. Checks on extreme inequality is the pattern because, while we recognize that full equity is impossible, we don’t want extreme differences in people’s wealth, social power and status. We don’t want certain people or groups to have an excessive ability to influence and impact other people, to shape public decisions, to undermine the quality of other people’s lives, and so on. Extreme differences in social power undermine people’s fundamental capacity to manage their own individual and collective affairs, which is the essence of democracy. This happens when only a few powerful people and organizations control the media, a few rich people and organizations pay for political campaigns, a few rich families or organizations control big sectors of the economy. 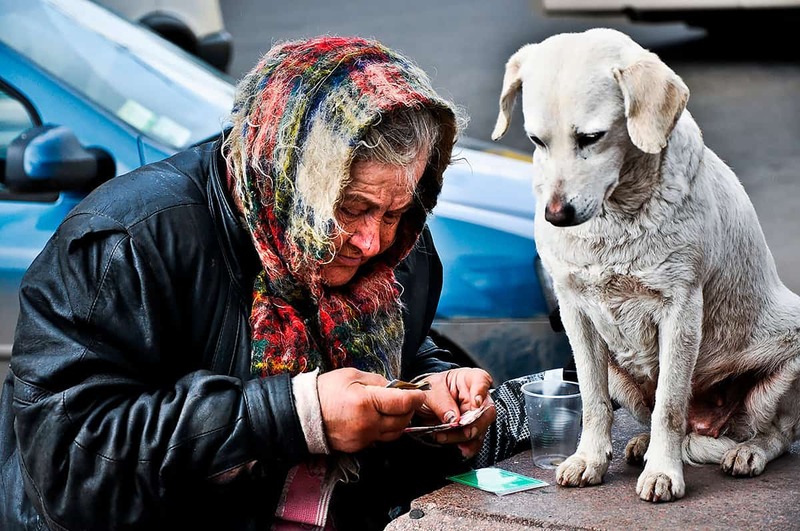 All these phenomena are natural consequences of certain people and organizations possessing tremendous concentrations of wealth – particularly when so many other people hardly own anything and can hardly have any impact at all. Lord Acton is most famous for his insightful observation that “Power tends to corrupt and absolute power corrupts absolutely.” So we want to stay quite far away from absolute power. So basic equity is both a resource for society – in that it helps people work together and think together clearly about what they want and how to get there – and it’s a feature of the society we want. It’s part of what we are doing all this for in the first place: to have a society that is fair and that is not messing with people. If concentrated social power is used in self-interested ways, it will harm a bunch of other people in the society and that is not “broad benefit”. So if we are trying to be collectively wise and if we are defining wisdom as broad benefit particularly over long periods of time, then the concentration of social power is a real problem. So this is an essential aspect of a design principle for wise democracy. You need to have some kind of checks on extremes of inequality, particularly of wealth, social power and status. But the more extreme inequality gets, the more you get concentrated social power (which is addressed in several other patterns) and that skews and distorts the collective cognitive power of the society. The ability of the society to think clearly and act effectively is distorted by special interests who possess highly concentrated social power. And that concentration also reduces the society’s social capital – which reflects the quality of relationships within and between groups – by stimulating resentment, rejection, and conflict between different types of people – different races, classes, genders, local people versus immigrants, and all the rest. The more we find extreme inequality of wealth, social power and status, the more these divisions within the society play out, and there is less and less social capital, community relationships, “social fabric” to work with. And that reduces the ability of the society to work together creatively to generate the kinds of long-term broad benefits that we’re talking about in our wise democracy studies. This concern occupies a somewhat different realm than the more familiar arguments about how inequality is unfair and negatively impacts people’s lives. These arguments are, of course, relevant to wise democracy because we ultimately seek a good quality of life for all concerned – and extreme inequality obviously undermines that. But I’m giving primary attention here to the fact that society’s collective intelligence and collective wisdom capacities are also undermined by extreme inequality, because that factor is both essential and almost always overlooked. 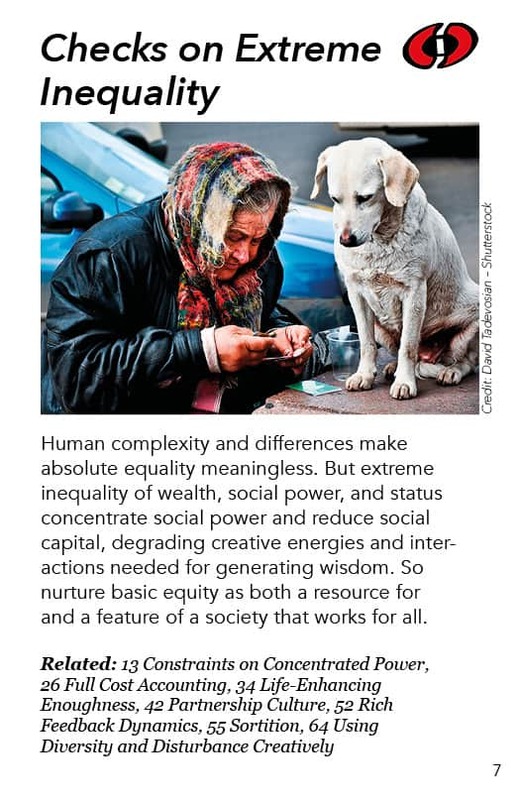 Extreme inequality needs to be checked so we have the collective wisdom to monitor – among many other things – the dynamic tension between freedom and equality among us. What we’re looking for here is not perfect equality but a basic sense of equity and an avoidance of extremes. It’s okay to have differences if the differences aren’t so great that they distort the society’s ability to think and act as a whole on its collective behalf in pursuit of the common good. Random selection in decision-making bodies and in selection for scarce resources and opportunities or for making undesirable sacrifices. Income is a major source of social power so having minimum wage is considered by lots of people in the U.S. to be very progressive. A minimum-wage is (at least theoretically) a “livable wage”: you have one fulltime job and are thereby able to pay your rent and get food for your family and get healthcare. A minimum wage is theoretically designed to give workers enough money to get by in that way. But the actual amounts of money provided are often unrealistic. Workers or families may need two or three minimum wage jobs just to survive in poverty rather than dying in the streets. Beyond minimum wage is the idea of a guaranteed minimum income. For example, everybody regardless of their economic condition – even the richest people – would get a minimum income of $10,000. The minimum income would be calculated so that somebody could live at a very basic level with just that income. That would instantly free many people – especially in the U.S. where there are inadequate public supports for services like health care and education – from all sorts of constraints in life to do more creative things including engaging more with their community and creating a better future rather than just grinding away at things that reinforce the status quo. Affirmative action is another effort to reduce extreme inequality, making sure that marginalized classes of people get some of the privileges and access – for example, to education and jobs – that more mainstream privileged people have enjoyed for many years. Social safety net programs of the so-called welfare state also seek to ameliorate problems at the bottom end of extreme inequality. They say that there is a level below which the society will not let you fall. Although some people abuse the supports that the government gives for poverty and disability, the vast majority of people who benefit from these programs are basically barely getting by. A bug in these systems – at least as they are practiced in the U.S. – is that living in poverty within the welfare system often keeps you at that level of poverty because if you get a little bit more income suddenly you don’t qualify for benefits and your actual quality life goes way down. Therefore, you have to get a lot more income before you actually have a survivable and livable life. If we’re going to use safety net programs, we need to design them not just to pressure people into low-paying jobs, but to enable people to actually get out of poverty without hurting themselves and their families. Providing free education and healthcare is another approach. I mention this because we don’t have it in the United States in any meaningful degree. In European countries, particularly Scandinavian countries, all citizens are well supported in these and other important aspects of life like child care. If everyone can get free education and healthcare, that creates a level of equity, a level of equal opportunity, of equal possibility in people’s lives – including the ability to participate in collective action and community work and so on. In the U.S. many people feel trapped in bad jobs because that’s their only source of healthcare or because they have tens of thousands of dollars of student debt to pay off. Some people advocate that in some organizations and businesses there should be limits on CEO pay or on management-worker pay ratios. In a top-down organization they look at the ratio between the CEO’s pay at the top and the lowest line worker’s pay at the bottom. The Mondragon co-ops in Spain have a 10:1 ratio. By contrast many multinational corporations have 100:1 ratios or far worse. In 2012 the CEOs at 300 of the top companies in the U.S. made, on average, more than 350 times the average wages of rank-and-file workers. http://www.aflcio.org/Corporate-Watch/Paywatch-Archive/CEO-Pay-and-You/CEO-to-Worker-Pay-Gap-in-the-United-States/Pay-Gaps-in-the-World So limiting such extreme ratios or the CEO’s pay is one other way to step towards equity. And of course unions fight, pressure and make a fuss to get more pay and better working conditions to reduce the difference between the people in positions of power and the people with less status and wealth. Wealth equity tends to be greater in societies with strong unions. Taxation systems can either reinforce inequity or create more equity. With progressive income taxes, a higher percentage of your income is taxed the more money you make. But some people are basically wealthy without working (e.g., with inherited wealth) and don’t have any income at all. So having a wealth tax on that static wealth has also been proposed. Whether you agree or disagree with it, it does push towards equity and it does reduce inequity. And lately more and more people are talking about taxing speculative financial transactions. Very few poor people participate in those speculative markets. Many such transactions are totally computerized and happen constantly in tiny fractions of a second, making it one of the biggest vulnerabilities in our global financial system. Very small differences in the value of the money of two countries can be picked up by computers every day, and they trade massive amounts for a profit. There are hundreds of billions of dollars circling the globe, as computers pick up on these small investment differences and make gobs and gobs of money for their masters. Having even a small fraction of 1% tax on that vast financial activity would generate trillions of dollars in revenue. So a lot more attention should be put on that because it has such a small impact on the people who are making all that money and a large potential benefit for the rest of the society. Accessible equal justice is a challenge. We do not have equal justice in the U.S. and many other places. It is hard for you to get justice if you don’t have a high-paid lawyer. So getting fair treatment in the justice system and the legal system means ensuring that you have good public defenders, lawyers that are paid by the government, to support people and to represent the people who don’t have the money to buy expensive lawyers. That is one of many ideas to make more equal justice available to everyone. Using random selection to staff decision-making bodies is an interesting idea because the ability of extreme wealthy people and organizations to manipulate the decision-making system is impeded by random selection. If it is set up right, there’s nobody to bribe. It is sort of like a trial jury system in the United States. The pool of prospects is randomly selected. It’s harder to bribe people who are serving temporarily and were chosen by random selection than it is to influence a legislator who is involved professionally over extended periods of time. Developing mutually beneficial relationships with a professional politician is easy for those with money and power. Random selection is also useful in selecting people to receive scarce resources and opportunities and to make undesirable sacrifices. Some countries and the United States have had a lottery system for recruiting people into the armed forces. Most people don’t want to serve in the armed forces. But if you can buy your way out of it, a lot of poor people end up serving in the army because that’s a place they can have a profession, and start at the bottom and work their way up even though they are at risk of getting killed or wounded in some major way. So having conscription be determined by random selection helps equalize who ends up in the army. You don’t want just poor people volunteering for the army in order to get a good job or wealthy people not having to serve. An example of the impact of that dynamic is how small a group in the U.S. Congress has actually served in the military. Fewer than 25% of our elected representatives are veterans – and they make the decisions when and where wars are to be fought. Getting into college is another place where random selection has been used. If you do not have enough colleges or you have very special resources or expensive services in your healthcare system, one of the ways to handle it is through random selection rather than by people being able to pay for expensive colleges or expensive medical care. There has been a lot of research lately showing that major wealth inequality in societies has many negative social effects. This is more for background information than a method or example. Thomas Pickety wrote a New York Times bestseller “Capital in the Twenty-First Century” which discusses the impact of wealth inequality in some detail. So many different approaches to wealth inequality have been developed because the problem is broadly recognized. I wanted to note it specifically for its impact on the ability of a society to be a wise democracy, and see how we can apply some of these many developed resources for minimizing extreme inequality for the purpose of increasing our ability to generate wisdom.